There was some great blogging, tweeting, storifying, and illustrating at CIPD14 and I’ve attempted to capture some of them in one place. 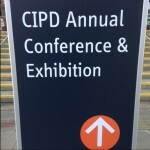 The CIDP14 event: Leaders in Learning: exploring new tools and skills in people development, starting with Ignite presentations from Andy Lancaster (CIPD), Niall Gavin (FirstGroup), Paul Taylor (NHS Employers), and Perry Timms (PTHR). CIPD14 session from Aimee O’Malley and Steph Fastre of Google UK on their approach to learning, and how people data informs that approach. CIPD14 – Katerina Rudiger (CIPD), Claire Maydew (M&S/Movement to Work), and Mike Thompson (Barclays) on some key initiatives to help young people to find employment.